November 29, 1978 - "You're about to see how we do the 2 o'clock news," instructs WQXR news director Bill Strauss, whose approach to news differs markedly from many of the "hipper" stations such as WXLO and even WABC. WQXR (AM and FM) is one of two commercial classical operations in the city. Hear how WQXR sounds in 1978, plus an interview with News Director Bill Strauss. Most of the station's news originates directly from the Associated Press and New York Times wires. Being the radio station of the New York Times, WQXR is the only radio station in the U.S. allowed to use the paper's news services. The station's news staff consists of one person: News Director Bill Strauss. The rest of the newscasts are read by staff announcers. "They have some almost octogenarian announcers there," says rival news director Paul Ehrlich at WABC, noting WQXR's style, which is steeped in a very formal broadcast tradition. "It can be a little stuffy." "I would say we reach a highly intelligent, affluent, well educated audience in the New York area," explains Strauss, "primarily because of the type of programming we do." "The other factor that enters into it is that we are the radio stations of the New York Times," says Strauss, "and in a sense we do reflect the sort of reporting that the New York Times does. That isn't to say that the Times dictates what we do; we run our own shop. But through years of association with them, we have pretty much come to adopt the same philosophy." 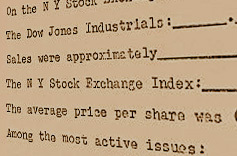 The station stresses stock averages in the daytime, Strauss figuring that financial news is of prime importance to his listeners. Strauss also feels they have a keen interest in international news, and the more serious points of national items. Click on the image to view examples of WQXR news intros and copy. "We do not, in our newscasts, 'let the bars down,' and become informal," says Strauss. "We avoid cute little funny stories, for example, as a means of ending a newscast. We have a limited time for news, and so we concentrate on what we consider to be important." WQXR does little rewriting, except to correct those "dangling things at the ends of sentences," in the New York Times copy. Strauss wonders aloud why newspapers "still write that way." Rarely does the station feel compelled to use an actuality [sound bite] in its newscasts. "We do not, except in grave emergencies such as a local power outage, or a disruption of telephone service -- something where we felt the story has to be told authentically, by whomever is in charge at the particular agency." An exception to that was during the newspaper strike, when the station presented voice reports from various New York Times correspondents. Strauss makes no pretense of having a large, aggressive news department. But. he feels his station, as the oldest FM commercial operation in the world, offers a compendium of the world's events for the day. 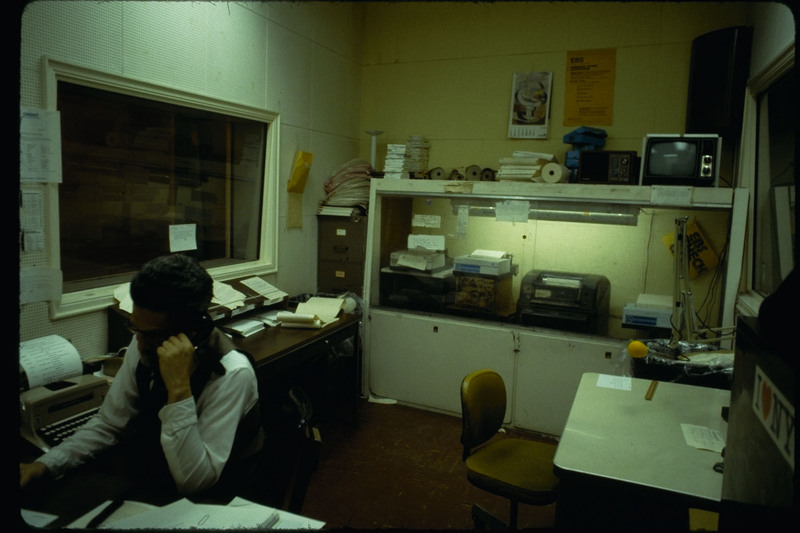 WQXR News Format - News format from a typical Fall morning, 1978. WQXR Schedules - A typical morning's news, Fall, 1978. WQXR News Scripts - Examples of WQXR news copy and lead-ins from Fall, 1978. WQXR Datasheet - Station stats on staffing, wires, equipment, and much more! Today's WQXR - Though the frequency for WQXR AM has since been sold, WQXR-FM is still going strong. Check out announcer profiles for some pics of the personnel and environment. WQXR and NYC stations in the 1964 New York City Blackout - A recreation from Broadcast Engineering magazine, by radio historian Jeff Miller.